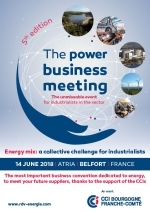 See general conditions "Power Business Meeting 2018"
Hotel (1 night per person and per company) and restaurant expenses taken care of on a flat rate basis. The Bourgogne Franche-Comté CCI can book your accommodation on request. Extra nights are not included and should be paid directly to the hotel. Your hotel details will be sent to you before the event.